The Coati Kids are at it again! Okay Dokey..I am new at this blog stuff but all the other Coatikids say I should do this too because it’s fun! 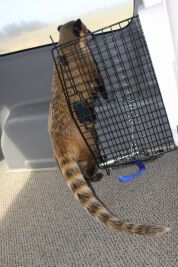 I’ll start my first blog by telling everyone what an interesting trip to my new home with CoatiMom and Coati Daddy was. I really enjoyed my time with Mommie Sarah, she took really good care of me. So big smooches to her and her new baby! CoatiMom says you’re always welcome to visit anytime. 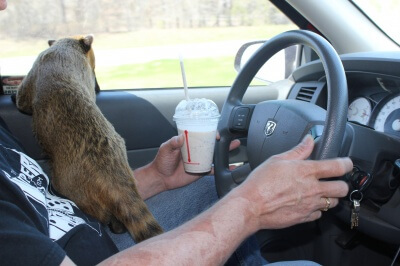 My new home is starting out pretty interesting with a fun ride home….I got to sit in CoatiDaddy’s lap and help drive home. When he decided to stop and get some snacks, I got some too. 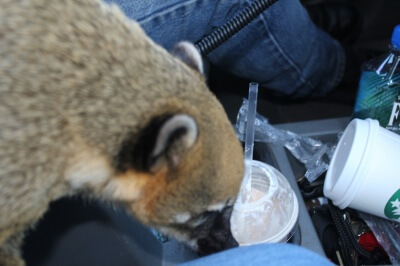 I ate the whipped topping off his shake when the drive thru worker handed it to him*giggles*, he had CoatiMom hold it and I quickly jumped up and slurped down the whipped cream…….. Yummy!! 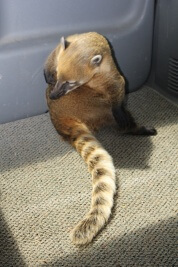 Then CoatiMom gave me a peppermint and sprayed some of the sweet smelly good perfume on me and it was simply heaven! This is going to be a really cool place to live……..I think everything is going to work out fine……. Previous Previous post: New Coatikid on the block! Next Next post: My First Day…The Scratch and Sniff Test…. Who do you want to visit?